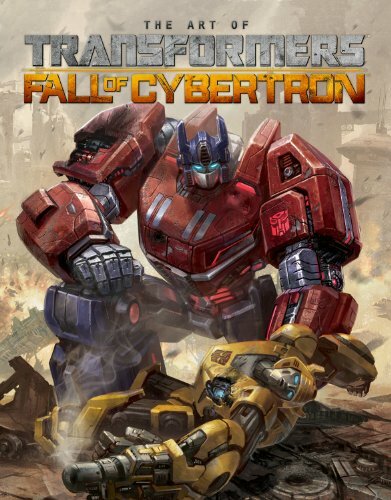 This is a terrific video game art book for Transformers: Fall of Cybertron. It's a huge 200-page hardcover published by IDW. Very appropriate considering the size of the Transformers. The book features the concept paintings and sketches for the numerous Autobots and Decepticons, environment art of space and cities, and lots of commentary. It's all art from the first to the last page. The art is awesome, epic. Everything is of a grand scale. The overall feel is textured and gritty. The environment art are wonderful. There are devastated war zones, futuristic but gloomy robot cities, and also interiors for some places. All the Transformers have new cool designs for the game. Most transform into vehicles or planes. Soundwave is now a car. Everything looks very different from the Michael Bay movies. Each Transformer is printed huge on a page by itself and there are different views of the transformed state. My favourites are the Dinobots concept art. Megatron is menacing but so are the rest of the Transformers. The other awesome piece is of the giant Metroplex. You'll see art from Jim Daly, Aaron Limonick, Norwood Cole, Eduard Marinov, Henry Lam, Jose Emroca Flores and Billy King. One thing is for certain, you don't have to play the game to enjoy the concept art. Highly recommended to all Transformers fans and art book collectors. Excellent review Parka! Very excited to see an art book for Transformers. Do you think there are adequate concept art coverage all characters from the game, or only the prominent ones are featured? Those featured on two page spreads are BumbleBee, Perceptor, Optimus Prime, CliffJumper, Jazz, Vortex, Swindle, Brawl, Bruticus, Onslaught, Blast Off, Soundwave, Megatron, StarScream, Grimlock, Sludge, Slug, Snarl, Swoop and Jetfire. Those with two or three Transformers on a page are Insecticons, Hardshell, Sharpshot, KickBack, Hound, WheelJack, Metroplex, Prowl, Ultra Magnus, Zeta Prime, Shockwave, Drag Strip, Quake, Ravage, Sentry, Leaper, Springer and Broadside. So yes, there's a lot of character concept art. Wow thanks for the comprehensive reply. Definitely getting this book.